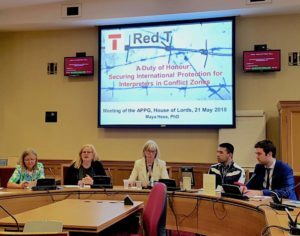 On May 21, the All Party Parliamentary Group on Modern Languages (@APPGMFL) convened in the House of Lords at the invitation of Baroness Jean Coussins, who initiated and chaired the meeting. Its focus was the pressing need to improve protection for interpreters in conflict zones. Dr. Maya Hess of Red T and Linda Fitchett of the International Association of Conference Interpreters summarized the advocacy efforts of Red T, AIIC, FIT, IAPTI, CLI, and WASLI – an international coalition representing 130,000+ translators and interpreters – on behalf of their vulnerable colleagues. They were joined by Abdul Bari, a former Afghan civilian interpreter who is currently appealing the rejection of his application for asylum in the UK, as well as his attorney, Lewis Kett of Duncan Lewis Solicitors (@DuncanLewis). Previously, Kett had successfully defended another linguist’s asylum claim, which resulted in the British Home Office reviewing its deportation policy. We are very grateful to Baroness Coussins for her commitment to our cause!